The Apple Watch is much more than just a great accessory, it can also be a tool to supercharge your work day and keep you productive, even when you’re work hours are different from everyone else. No matter what industry you work, in there’s definitely an app that can make your life run much smoother. There are some pretty fantastic apps out there for creating and managing to-do lists, interacting with your office colleagues, and even clocking in and out of a job site to ensure you get paid. While all these are apps are fantastic for work, many of these apps can also come in handy when you’re trying to do things like organizing your household or personal life. Take a look at some of the best options out there (including some stock apps built into the Apple Watch from day one, and adapt them to meet your own personal needs. This is one of the simplest things you can do, but also one of the most powerful. Setting up email notifications on your Apple Watch can ensure that you know what’s going on, no matter what you happen to be doing. For instance, an email notification can discretely let you know a meeting has been put on your calendar while you’re sitting in another one. Using your Apple Watch for important notifications such as email and texts can be a great way to stay on top of things discretely, rather than having your phone or laptop out all the time while you’re trying to perform tasks in person. Reminders is one of those apps that you might forget to utilize until you realize what a powerful tool it can be. “Hey Siri, remind me to pay the electric bill,” is a pretty useful request, not to mention things like sending important emails, paying bills, or even remembering to do a load of laundry tonight so you’ll have clean underwear for the office tomorrow. If you’re not currently a Reminders users, try using the app for a week. Once you realize how wonderful it is to be reminded of the things you often forget, we bet you’ll never go back. Need to look up a quick stat? Want a reminder later to pick up your dry cleaning? While you might not always think of using Siri in situations like those, she can actually be really helpful. One of our favorite things to do with the Apple Watch is to use it to set up reminders and alarms. Ask Siri to remind you to send an email in an hour, or to set an alarm for 20 minutes so you don’t get distracted by email and forget to take your lunch out of the oven. Think about some of the time-sensitive things you do on a daily basis and consider giving Siri a try. It can take a little while to get used to, but using Siri on your wrist is quick, easy, and can save you a ton of time and keep you on task. If your company uses Slack, then you owe it to yourself to download the iPhone app, and consequently the Apple Watch app as well. Notifications will show up on your wrist following the same settings that you use for mobile notifications. You can even set it up so you receive a push notification on your Apple Watch whenever someone sends you a direct message or mentions you within a Slack conversation. You may not always reply immediately, but it’s nice to know that things are happening behind the scenes, or see a problem that you need to respond to as it’s happening rather than having it become an unexpected surprise when you're back in front of your desktop. You can also respond to Slack messages directly from your wrist. It’s admittedly a bit awkward to do so, depending on the intricacy on your message. Just like text messages and emails, you can use the preset messages built into the watch. You can also dictate messages using your voice, although depending on the length of your message that can also be a bit problematic. One easy solution is to change one of the preset messages in your Apple Watch to something like “I’m away from my computer right now. I’ll get back to you soon.” That can let someone know that you’ve seen their message, but that you’re otherwise engaged at the moment. Trello is a terrific productivity app. You can use it to manage everything from paying bills to invoicing and following up with clients. It’s super intuitive and easy to use and is the perfect thing to keep you on track with tasks and remember what you've committed to and when. With the Trello Apple Watch app, you can add new tasks, check out when your current tasks are due, and respond to comments from others you might have been collaborating with on a particular board or task. Much like Slack, Trello is one of those things that you always want to stay on top of, even if work has taken you away from the office for the day. Trello’s Apple Watch app is a wonderful way to keep up with what’s going on in the office and with projects, even though you might not personally be there to handle them at the time. When you do need to deal with a particular task, Trello also has a full-featured iOS app, so you can quickly log in on your iPhone or iPad and handle something that needs your immediate attention while you’re on the move. If your office uses HipChat instead of Slack, you have an Apple Watch option for that as well. HipChat’s Apple Watch app doesn’t offer quite as many features as some of the other options out there, however. With it, users can receive messages sent to them using HipChat on their wrist, and there respond with a vote message or one of HipChat’s four pre-programmed responses consisting of an OK, question mark, thumbs up emoji and thumbs down emoji. 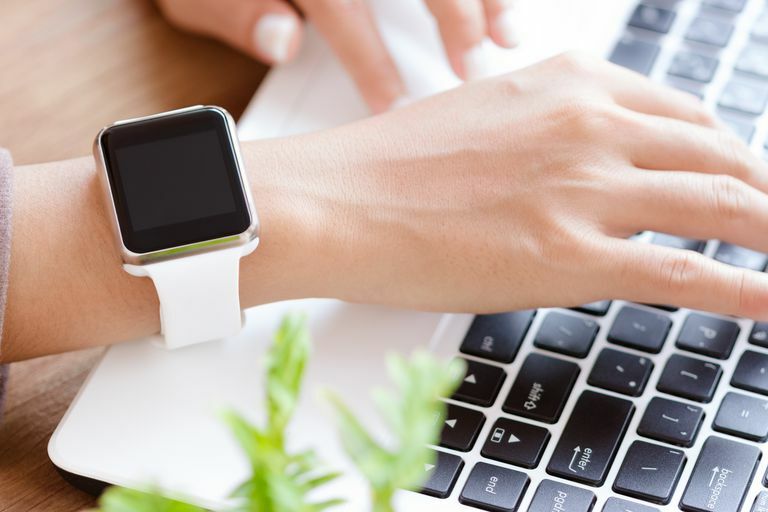 If your company uses Salesforce, then getting the Apple Watch app can improve your productivity and keep you connected when you’re away from your desktop. Within Salesforce’s Apple Watch app you can view different dashboards, look up reports, and even get notifications for things like case escalations and deal closings. It can be an excellent way to stay on top of everything without having to tote your computer around everywhere you go, especially if you have a job that requires you to stay mobile rather than tied to a desk. If you’re someone that gets paid hourly based on the time you spend at a job site, then it’s important that you log all of that correctly. Invoice2Go allows you to set up a geofence around a particular location, say a construction site, and then reminds you to start a timer when you arrive. Sort of a virtual version of a time clock, you can clock in and out using the Apple Watch app and do things like send invoices or receive notifications when invoices have been paid. When it comes to productivity, the Evernote app is one of the oldest but best tools out there, and now it’s available for the Apple Watch as well. With the Evernote Apple Watch app you can perform searches within things you’ve saved to Evernote, set reminders, check off tasks from your to-do lists (even shared ones like the family grocery list), and view recent content. The app is designed to work seamlessly with its iPhone app, so if you’re looking on something on your wrist and need a bigger view, opening the app up on your iPhone should bring you to the same page you were viewing on your wrist moments before. Evernote can be great for keeping track of to-do lists, but can also be a storage space for articles you’ve found interesting or even recipes you want to try. This one isn’t exactly a productivity fix, but it can add a bit of a wow factor to your work experience. Microsoft developed a PowerPoint Remote app for the Apple Watch, which makes it easy to navigate through individual slides while you’re doing a presentation. if you ever tried to click through slides on your desktop while presenting to a group, then you know that process can be cumbersome and often make you feel like you’re disconnected from the meeting. With PowerPoint Remote you can navigate through slides, see the slide that you’re currently showing the group, and perhaps most importantly, see how much time has elapsed since you started the presentation. Using your Apple Watch to present can be a much smoother way of handling your presentation, and can make leading that meeting much easier.